It was a moment of celebration and overwhelming joy as Christ Apostolic Church, Oke Ibukun, Shogunle Zonal Headquarters, Lagos holds her 50th harvest and thanksgiving service on Sunday 2nd of December, 2018. The annual harvest which has the theme 'Seed Time and Harvest' coined from Genesis chapter 8 vs 22 was preceded by a 5-day revival which started on Monday 26 to Friday 30th November. 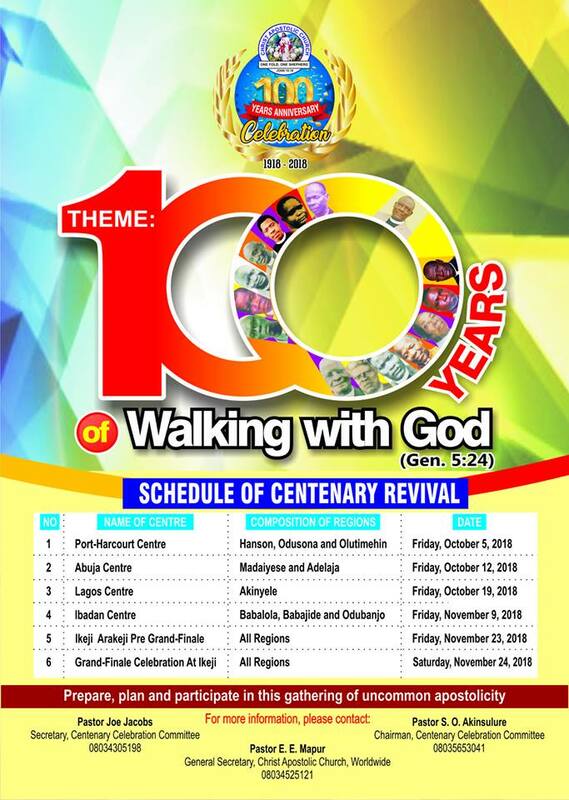 Christ Apostolic Church Oke Ibukun, Shogunle Zonal Headquarters was established in 1967 with few members and has been spreading its tentacles since then. The Zonal Superintendent of the Zone, Pastor J.O Falade while giving welcome address noted that the harvest is a mile stone in CAC Worldwide because CAC just concluded the centenary celebration grand finale and this harvest is one of the first harvest in another centenary. He also emphatically told people that this is beginning of a new thing in CAC Shogunle Zone, admonishing that members should not remember the old things but focus on new things, adding that if a new thing has to come there will be change and change is constant. 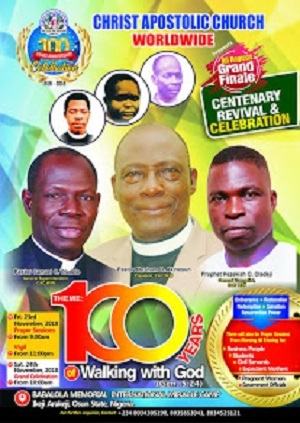 Pastor Falade who is celebrating harvest with the zone for the first time and also looking forward to the 100th harvest of the church recalled that at the grand finale of the centenary celebration of CAC Worldwide the only living pioneer member of the church, Elder Eniayewu was invited to speak on how the whole thing started. He said the Elder who is one hundred and twenty-three years old disclosed that the church started as a prayer band led by Mrs. Sofia Odunlami in St. Saviour Anglican Church, Ijebu-Ode. The prayer band, Faith Terbanacle was later sent out of the church because the population of the prayer meeting then was more than normal church service and the band moved to a primary school beside the church. According to him, the prayer band started prayers in 1918 and their focus was on Holy Ghost outpour. He further revealed that during a prayer session one day, God spoke to the prayer band that He will raise a mighty Prophet for them if they do away with sin and jewelries and God later raised Apostle Joseph Ayodele Babalola in Ilesa, Ikeji-Arakeji for them. Pastor Falade concluded by urging the church to cooperate with the pastorate and have a flexible heart.